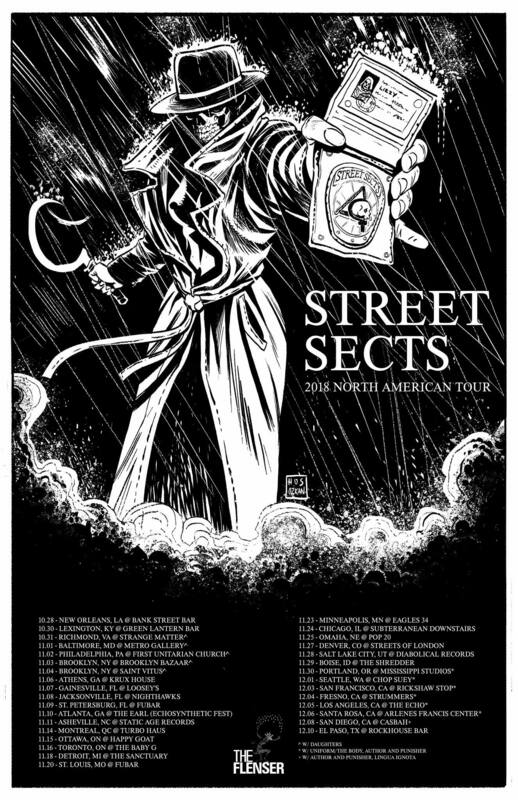 Hellhounds of electronic/industrial noise, Street Sects have announced a mammoth North American tour, starting in Denver on October 28 and concluding in El Paso, Texas on December 10. Selected dates will also include guest appearances from the likes of Daughters, Author & Punisher, Uniform, The Body, and Lingua Ignota. The tour kick-starts just after the release of their second studio album, The Kicking Mule, which is the greatly anticipated follow-up to their 2016 debut album End Position. Street Sects very recently teased us with the awesome “In For A World of Hurt”, which marks a clear evolution from the already fluidly chaotic sounds of their previous work. Fans have been given no shortage of one-off songs in recent times, so a new feature release will be extremely well-received. The release of the full album will be a special and also terrifying event. But nothing contextualizes the boundless onslaught of their music quite like a Street Sects live show, as any fan will testify. Strobe lighting, bass to atomize eardrums, and partially visible performers screaming like Planet Earth is on its way out are all to be expected. Any don’t go hoping any of their tour buddies will act any more civilized either. Tread carefully! The Kicking Mule will finally be released October 26 and can be pre-ordered here. To hear more Street Sects in the meantime, check out their Spotify and Bandcamp pages. For other news and tour info, visit their official Facebook page. Previous PostListen as Outre Submit to "The Order Of Abhorrence"
Next PostPsycroptic Release New Song – New Album Coming in November!